This is a list of Star Wars species, containing the names of fictional sentient species from the Star Wars franchise beginning with the letters K through O. Star Wars is an American epic space opera film series created by George Lucas. The first film in the series, Star Wars, was released on May 25, 1977 and became a worldwide pop culture phenomenon, followed by four sequels, three prequels, and two animated television shows. Many species of alien creatures (often humanoid) are depicted. The Kaleesh are a nomadic and politically neutral race from the planet Kalee. A bipedal reptilian species, the Kaleesh have reddish brown scaly skin and cover almost all their bodies to protect them from Kalee's blistering sun, usually leaving only their four-fingered claws exposed. Most wear masks carved from the skulls of their most feared creatures such as the karabac and the mumuu. During the Huk War, the Republic sided with their enemy, destroying their economy and deepening the already hard times hurting their homeworld. The Intergalactic Banking Clan, headed by San Hill, later came in and helped them out of their depression through a deal for the Kaleesh to join the Confederacy of Independent Systems (CIS). One Kaleesh cyborg, General Grievous became the feared military leader of the CIS during The Clone Wars. Although his original form was not shown in Episode III, Grievous had statues of his former self in his home at Vassek during the Clone Wars. One statue remains unchanged, but two more have the golden arms and mask that Grievous has as a cyborg. Tall, thin aliens with pale skin from the isolated planet of Kamino; the most distinctive feature of Kaminoans are their long necks. Males also have a ridge along the back of their heads. They like to be isolated from the galaxy. Kaminoans were forced to reproduce through cloning after a natural disaster on Kamino. They work creating and training clones for third parties from stations on massive platforms above the sea. Kaminoans seem to be unconcerned about the ethics of their workings. Darth Tyranus (Count Dooku) erased all traces of planet Kamino from the Jedi archives. Kaminoans developed the Grand Army of the Republic, as shown in Star Wars: Episode II – Attack of the Clones. They resemble the stereotypical image of grey aliens in their face and limbs, and engage in similar activities that seem to revolve around genetics and physical experiments. Kaminoans were able to see colors in the ultraviolet and the infrared spectrum. While to Human eyes the halls of the Kaminoan cities were spotless white, to the Kaminoans they were vividly colored. Taun We and Lama Su are examples of Kaminoans. The Karkarodon were a race of shark-like sentients from the world of Karkaris. They were first introduced in Star Wars: the Clone Wars. The Kel Dor, sometimes referred to as Kel Dorians, hail from the technological planet Dorin. They require masks to protect them from oxygen-rich atmospheres and to protect their highly sensitive eyes from light. They are also known for their Force Sages, the Baran Do. One prominent Kel Dor is Jedi Master and Council member, Plo Koon, but Plo is not the only Kel Dor Jedi of his family. His niece, Sha Koon is also a Jedi, but she is not in the movies, or any of the Clone Wars episodes that aired so far. The Keshiri are a near-human species from the Wild Space planet of Kesh. The race characteristics include purple or lavender colored skin and hair colors which include silver and white shades. About five thousand years before the Battle of Yavin, a Sith starship crashlanded on Kesh; the crew, who came to become known as the Lost Tribe of Sith, subsequently subjugated the Keshiri, some of whom eventually joined the Sith. The Keshiri were introduced in the Fate of the Jedi novels. The Kiffar are a near-human species from the Azurbani system, including Kiffu and Kiffex. The Jedi Master Quinlan Vos was a Kiffar. The race characteristics seem to include dark, tanned skin and long thick dark hair, usually worn in dreadlocks, and there are certain tattoos that are ceremonial. One in a hundred Kiffar inherits a psychometric talent to read the history of objects that they touch. The Kiffar seem to be clannish and their strongest members compose an order known as the Guardians, which seems to be rather powerful. Kitonaks (also known as Kirdans) are white, pudgy aliens from Kirdo III. They show a tough skin which folds to seal vulnerable openings, a trait evolved to protect them from the harsh environment of Kirdo's deserts. They also have some double organs, including two pairs of lungs. Kitonaks are very dexterous, but also very patient. They never rush. This is because they feed on animals called choobas and they must stand motionless for a long time until a chooba gets near them. Even when talking with humans or other aliens, Kitonaks are painfully slow to answer any question, and equally slow to walk as they do not move their legs, but expand and contract the muscles of their feet. Kitonak have two toes and three fingers. They eat once a month. They also have a phobia of quicksands and caves. Droopy "Snit" McCool of the Max Rebo Band, Anarc, Kruc, and Terno are the only known Kitonaks. Klatooinians come from the planet Klatooine. When the Hutts were waging a war against Xim the Despot, they looked for help on some planets. As a result, the Hutts asked the Klatooinians to become part of their army. Since the Klatooinians thought it was some kind of sacred war, their leader Barada M'Beg signed a treaty so that the Klatooinians would be slaves of the Hutts forever. After defeating Xim, Klatooinians remained slaves of the Hutts. Most of their children are named Barada to honor Barada M'Beg. One of the thugs on Jabba the Hutt's skiff was a Klatooinian named Barada. See also Nikto and Klaatu barada nikto, a famous quote from The Day the Earth Stood Still. One Klatooinian Jedi is Tarados Gon. Kobok were an insectoid species that live on planet Koboth. They have two orange compound eyes and three-fingers. One famous face was Gaff, a Roon representative in the New Republic. The kowakian monkey-lizards are a vulturous sentient species from the planet Kowak. They are small, with beak-like mouths and large ears. When born monkey-lizards come out in a larval state. It is a well-known fact that monkey-lizards laugh, a lot. On their home planet their laughter is used to scare predators away, because of how loud they laugh. When in captivity, they are not paired with other species because their laughter is too great and too loud. Salacious B. Crumb was one of the most famous Kowakian monkey-lizards, as he is the only one seen in any of the Star Wars movies. An unnamed, fuchsia-skinned Kowakian monkey-lizard appears in 2 episodes of Star Wars: The Clone Wars, "Dooku Captured" and "The Gungan General", as the pet of Hondo Ohnaka, leader of a band of Weequay pirates. The Kubaz are an insect-eating species that have been known to be informants for the Empire. One such Kubaz, by the name of Garindan, led Imperial stormtroopers to the droids on Tatooine in A New Hope. Because of their diet, the insectoid Verpine have a marked distrust of the Kubaz who have often taken great steps to procure Verpine specimens for their suppers. The Kurtzen are a pale, hairless, humanoid race from Bakura. Being the only native sentient species on Bakura, and few in number, they were quickly outnumbered by human colonists. 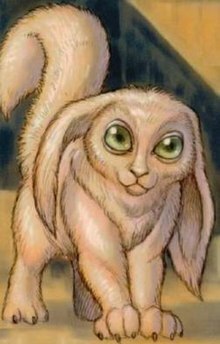 Kushiban are small rabbit-like creatures that live on Kushibah in the Star Wars galaxy. Distinguishing features include large black eyes, floppy ears, and a long tail. They are capable of walking on either their hind legs or on all fours, though to move more quickly in a run or a charge, they must run with all four appendages. On their hind legs they stand at 0.5 meters or 1.6404 feet tall, with an extra 0.3 meters' worth of tail. While often mistaken for cute, pet-like animals, they are actually intelligent beings with a complex culture as well as both a written and spoken language. They have mastered fire (used to frighten away hostile, fire-fearing Xinkras) and can use technology. Rather than paws, they have hands with opposable thumbs and feet. As a means of communication, Kushibans' fur changes color in correlation to its mood. A Kushiban in a calm, normal state of emotions is white; a Kushiban in the deepest of despairs is totally black. While they tend to stay on Kushibah, the occasional Kushiban is called away by wanderlust or a specific need. Jedi Master Ikrit is the most famous of the Kushiban who have done so. The Kwa were an ancient, blue-skinned race that lived on the planet Dathomir. They created the Star Temples and the Infinity Gate on Dathomir around 100,000 BBY. Over time the Kwa sealed their temples and left large wuffa worms to guard them. Nobody really knows what happened to the Kwa, but the ones that were on Dathomir devolved into the primitive Kwi. A primitive, blue-skinned, saurians species native to Dathomir, the Kwi degenerated from the Kwa, the masterminds behind the Star Temples and Infinity Gate on Dathomir. In 31 BBY, many Kwi were slaughtered by the Nightsisters of Dathomir in an attempt, by the Nightsisters, to unlock the power of the Infinity Gate. By the time Luke Skywalker and Prince Isolder landed on Dathomir in 8 ABY, the Kwi had split up into different tribes, two of which were the Blue Mountain People and the Blue Desert People. The Kyuzo are a race of humanoid creatures. They have green skin and have masks to filter out moisture. A famous Kuzyo is the bounty hunter Embo. The Lannik are a race of tan skinned humanoids from a plant of the same name. They have long ears, similar to Yoda's species. The most prominent one is Even Piell, a member of the Jedi Council. The Lasat are a crafty and sneaky sentient species from Lasan. They are stronger, swifter and stealthier than humans. Their planet is taken over by the Empire who commit a mass genocide on its people. Zeb Orrelios from Star Wars: Rebels is a Lasat. The Lasat's origin is from the planet Lira San (the Lasats' true homeworld), and sometime in between they settled the planet Lasan. At some point Lasan was destroyed by the Empire. Zeb likes to bash the "bucketheads" as revenge for Lasan's destruction. Imperials don't stand a chance against him. The Lepi are a rabbit-like species that stand on two legs. The Letaki are a race from the planet Letaki in the Star Wars universe. Letaki have eight tentacles and egg-shaped heads. Evar Orbus is an example of a male Letaki. The Lurmen (also known as Mygeetans) are a diminutive, pacifistic lemuroid mammalian species native to the crystalline world of Mygeeto and also had a settlement on Maridun. Their bodies were covered entirely in fur, which ranged in color from a dark brown to a white-gray, though they did wear garments. The Lurmen had heads protruding perpendicular from their chest two large golden orange eyes, a nose and a mouth. Each Lurmen had a tail, and they communicated through speech; Lurmen were able to speak Basic. Some Lurmen had the ability to curl up into a ball and roll along the ground, such as Wag Too. Lurmen were able to cover large amounts of ground at great speed. The Massassi were an ancient primitive warrior race that were enslaved by the Sith. The Massassi were brought to Yavin 4 by the Sith Lord Naga Sadow who was on the run from the Republic and the Jedi. They were originally a red-skinned humanoid race until Naga Sadow conducted cruel genetic experiments on them turning them into a race of fearsome, savage, hunchbacked predators. Despite this cruelty, the Massassi treated Naga Sadow as a god by building huge temples and palaces to honor their Sith Lord. They became extinct when Exar Kun sapped the life out of every Massassi on Yavin 4 so that he could free his soul from his body in order to escape the pursuing Jedi. Only one Massassi, named Kalgrath, survived. During the Galactic Civil War, the Rebel Alliance built a base in the old Massassi temples on Yavin 4. It was from this hidden base that Rebel starships were able to score their first victory against the Empire, and from which squadrons of X-wings and Y-wings attacked and destroyed the first Death Star. In 22 ABY (After the Battle of Yavin), during the time covered by the Junior Jedi Knights series, Anakin Solo and Tahiri Veila were led by the Force to find a large golden globe deep inside a Massassi temple on Yavin 4. Inside the globe were the imprisoned souls of Massassi children whom the young Jedi candidates eventually freed with guidance from Jedi Master Ikrit. The Melodies are an amphibious, mermaid-like humanoid species that live in Yavin 8's purple mountains, lakes and rivers. They appeared in the second book of the Junior Jedi Knights series. Melodies are hatched from eggs, then live on land for a short time during their youth, and at a certain age, Melodies undergo a ritual called a Changing Ceremony, in which they change forms that will no longer enable them to live on land. When Exar Kun imprisoned the Massassi children on Yavin 4 during his reign in 3,997 BBY (Before the Battle of Yavin), the parents of the Massassi children went to Yavin 8 and met the Melodie children, whom they asked for help. The children took them to the Elders, but because of the Elders' forms, they could not leave the waters. The Massassi carved messages into the walls of a cave, hoping that someone would eventually arrive who could read their language and come to their aid. A millennia later, Sannah, a Force-sensitive Melodie, helped Anakin Solo and Tahiri Veila (who had come to Yavin 8 with Lyric, a student from the Academy who was about to undergo the Changing Ceremony) to decipher the carvings. The information helped them to ultimately free the imprisoned Massassi children later in the Junior Jedi Knights series. An alien species from Circarpous V, the Mimbanites were related to the Coway. When the Empire took control of their planet, they thought this species was not suited for the physical demands of slavery. An alien race almost exactly the same in appearance as humans, Miraluka differ in that they have no eyes or blank white sockets and cannot see through the focusing of light. Miraluka typically hide their lack of eyes by wearing a headband, a mask, or similar concealing headwear, because they are much less common than humans, and it is easier to travel if they are seen as being of the dominant species; thus the common confusion as to who is or isn't a Miraluka. Miralukas see through the Force , as they are a Force-sensitive race; they are often quite shocked if shown life not connected to the Force, like the Jedi Exile. The Miraluka homeworld is Alpheridies. They migrated there after their original homeworld, Katarr, became unstable and began losing its atmosphere to space. Alpheridies' sun emits light in the infra-red spectrum, and this led to the Miraluka losing their ability to see visible light over thousands of generations. Instead, they came to rely on a latent ability to perceive the world through the Force. A colony world of the Miraluka named Katarr was stripped of all life by a Sith Lord named Darth Nihilus approximately 3,955 years BBY, during a meeting of several Jedi Masters. The meeting was convened to discuss the silent war being waged across the galaxy by Sith Lords Darth Nihilus and Darth Sion. The only survivor of this colony world was Visas Marr, who later became the servant of Darth Nihilus and then followed the Jedi Exile and helped destroy Darth Nihilus and his ship. Notable Miraluka include former Sith Visas Marr, and the Dark Jedi Jerec. The Mirialan race is a species native to the planet Mirial. They have purer eye colors than humans, some have either paler or darker skin colors, and tattoos covering some part of their face that represent individual achievement in some field. They have extrasensory organs on their heads, sensitive to dryness. Jedi Master Luminara Unduli and her Padawan learner, Barriss Offee are both Mirialans, as is the Seventh Sister Inquisitor seen in Star Wars Rebels; no male Mirialans have been named. The Mon Calamari are an amphibious race from the planet Dac (often referred to as Mon Calamari in Galactic Basic). They are humanoid, about 1.7m tall, and are most commonly seen with salmon-coloured skin (though their skin may have other tones as well, including blue, dark blue, green, and purple) and a squid-like, domed head with large eyes and webbed hands. With their eyes toward the sides of their heads, they must turn slightly to study visual objects. They are shore dwellers, but like to be close to water, and can breathe under water if necessary, being able to descend to depths of 30 or so metres without equipment. They share their home planet with the Quarren. Their name is a reference to the close resemblance of their heads to calamari (squid). Mon Calamari tend to prefer modern Republic style clothing, while the Quarren wear more traditional robes. During the Clone Wars, the Mon Calamari remained with The Republic, but the Quarren sided with the CIS. The CIS sought to overthrow the Calamari quickly by providing the Quarren with a huge underwater droid army. With the aid of Jedi Kit Fisto, the Calamari demonstrated their traditional underwater fighting techniques. Riding underwater mounts, they carry shields and lances that contain blasters. During the Galactic Civil War, the Mon Calamari eventually joined the Rebel Alliance after the Empire used a Star Destroyer to destroy three floating cities on their watery world. They proved an invaluable asset, primarily due to the Mon Calamari being masters of starship construction and supplying the Alliance with badly needed capital ships, Mon Calamari Cruisers, that could take on the Galactic Empire's ships of the line. Prior to joining the Alliance, the Mon Calamari had only built passenger liners because of their peaceful ethos. Also renowned for their performance art, lithe Mon Calamari water dancers often perform in some of the galaxy's most prestigious venues, including Coruscant Galaxies Opera House, where the ballet "Squid Lake" ran for some time during the waning days of the Republic and was known to be a personal favorite of Supreme Chancellor Palpatine. The most famous Mon Calamari is Admiral Ackbar, the supreme admiral of the Rebel Alliance's naval forces. Another Rebellion-sympathetic male Mon Calamari named Quarrie, the spacecraft engineer character named for Star Wars visual artist Ralph McQuarrie, was the designer of the B-wing starfighter prototype named the Blade Wing, as seen in the Star Wars Rebels second-season episode Wings of the Master. Mon Calamari are a playable species in Star Wars: Galaxies. In the Star Wars: Legacy comic, Darth Krayt launched an attack on the Mon Calamari and wiped almost all of them out through gassing, making the Mon Calamari an endangered people in this continuity. Mustafarians are the native inhabitants of Mustafar. They have leathery skin with a cloak and a trunk. Not much else is known about this species as they live in seclusion. They are believed to be sentient and are able to withstand extreme temperatures. They have saddles for lava fleas and carry defensive laser rifles. As a manhood ritual they leap across "water-falls" of magma wearing no protection. When the Techno Union established mining facilities on the planet, many of the Mustafarians took up jobs as workers at one of the many mining facilities. A thin, tall species from Muunilinst, Muuns have pasty-white skin. Their bodies were elongated and thin, with equally elongated and thin heads. Muuns do not like travelling, and they usually stay indoors. Muuns are also known for having long life. Muuns controlled the InterGalactic Banking Clan. During the Clone Wars, Muuns helped the Separatists and minted new coins for planets leaving the Republic. Notable Muun were Darth Sidious's master, Darth Plagueis the Wise, and the ruling members of the InterGalactic Banking Clan including San Hill. Darth Plagueis had the ability to use the dark side of the force to influence midi-chlorians to create life and to prevent people from dying- the only Force user to have such a power. A 4-armed, crystal-skinned alien species indigenous to the planet Wayland. The Myriad are an ancient race of highly intelligent cybernetic beings. Their true form is not known because the cybernetic implants vary. Their home world is the planet Trieron They have no affiliation with any one group, but serve all races. The Nagai are aliens with pale skin, jet-black hair and angular features, they lived on the planet Nagi, beyond the borders of the Old Republic and the Empire. They were originally known as "Knives". They were natural enemies of the Tof, usually waging wars against them. They are habitually forgetful, particularly regarding things that pertain to annual events. Darth Nihl is a Nagai. Nautolans are amphibious humanoids with a range of skin colours from greens to blues and greys, a cartilage-reinforced skeleton, and shark-like eyes. Instead of hair, a Nautolan sports a crown of long tendrils, 14 to be exact (used to discern the feelings and moods of those around them. These appendages are almost useless out of water unless, like Kit Fisto, said Nautolan is used to environmental change). Their homeworld is Glee Anselm, a planet of vast swamps, lakes, and seas located in the Mid Rim. However Nuatolans are relatively common at any space port. Nautolans reflect the moods of those around them. When confronted by anger and violence, they respond in kind. When approached in a calm, civilized manner, they seem helpful and polite. Jedi Master Kit Fisto was a Nautolan. Neimoidians are the most visible villains of the film The Phantom Menace. According to the Star Wars expanded universe, Neimoidians are descendants of Duro colonists that landed on Neimoidia in the year of the Republic inception. At some point in their development, the Neimoidians learned to domesticate giant beetles, and they have been getting others to do physical labor for them ever since as stated in Labyrinth of Evil. By the time of The Phantom Menace, the Neimoidians control the galaxy's largest commercial corporation and are at the head of the powerful Trade Federation. Neimoidians are born as grubs and placed in communal hives until the age of seven. Inadequate food is fed to young Neimoidians in order to encourage acquisitiveness. Those who hoard enough food survive while those who do not hoard die. Even as adults, Neimoidians tend to be greedy, possessive, and fearful of death. Eventually, the grubs learn that to survive, they must kill each other; therefore out of the many grubs that are born, very few survive. Neimoidians have been stereotyped by other races in the galaxy as corrupt and greedy, particularly after the Battle of Naboo. They are certainly willing to resort to extortion, lies and manipulation, but their success also lies in exceptional organizational abilities. Training in organization revolves around Neimoidia's mass hives and huge fungus farms. Neimoidian young are placed in a community hive where they are forced to combat their siblings for food and other necessities. The weak die, since the strong hoard food and resources. This is said to be the source of their characteristic greed and corrupt nature. The Neimoidians do not view themselves as wicked, but rather focused on being the best they can be in their society. The Trade Federation army is employed only when "future customers" do not realize their "best interest" in trading with Neimoidians, on Neimoidian terms. Lott Dod wears a tall diplomatic ploov and a purple representative's mantle over a very expensive robe of Tyrian violet cloth. Nute Gunray, Commanding Viceroy of the Federation army, wears a showy crested tiara and blue viceroy's collar. Rune Haako, legal counsel to Nute, wears an attorney's cowl. Daultay Dofine, captain of the flagship vessel for the Naboo invasion, wears a tall command officer's mitre. An unnamed Neimoidian wears a lavender collar identifying him as a financial officer. The most exalted Neimoidians rank a walking mechno-chair. Neither comfortable nor practical, mechno-chairs are very expensive beetle-like seats which can carry a lazy Neimoidian or project hologram transmissions. Neimoidians also employ a number of prestigious protocol droids, including the brilliantly silver TC-14. TC-14 is kept docile through frequent memory wipes and is employed to distract guests while the Neimoidians devise manipulation strategies. In contrast to the rare and showy technology of the Neimoidian elite, the battle forces of the Neimoidians are mechanically advanced, but cheaply mass-produced. An emphasis is placed on massive, intimidating numbers of mindless battle droids controlled through a central computer. This unquestioning reliance on a central control is what will ultimately spell failure for the mechanized army. Episode II revealed that their form closely resembles that of the vaguely insect-like natives of Geonosis, where the droids are mass-produced. Much like many of the Imperial Officers in the Original Star Wars Trilogy were given British accents, some Neimoidians have been given Thai accents. Canine-muzzled humanoids introduced in Season 3 of the animated series Star Wars: Clone Wars. They live on the planet Nelvaan on the Outer Rim. All of their warrior braves were captured by Techno-Union scientists and were physically and mentally mutated into large bear-like creatures with their left arms replaced with laser cannons, to try to create perfect cyborg soldiers for the CIS. During the Liberation of Nelvaan, Anakin Skywalker, who was referred to by the race as "Holt Kezed" ("Ghost Hand" in their language), would free them as he destroyed the Separatist base. Following this, Anakin killed all Techno-Union scientists there and managed to bring the mutated Nelvaanians back to their tribe. On a behind-the-scenes note, the name "Nelvaanian" may be a reference to Nelvana, the Canadian animation company who produced the Star Wars: Droids and Star Wars: Ewoks animated features for Lucasarts. Nelvana's logo is a blue polar bear. The Neti were a race of tree-like beings from Rykk. Jedi Master Ood Bnar was a Neti. The Nikto people are a humanoid species from the planet Kintan who have scaly skin, black eyes, and symmetrical horns and spikes on their faces. Subspecies include Green Nikto (Kadas'sa'Nikto) and Red Nikto (Kajain'sa'Nikto). Niktos are first introduced in Return of the Jedi (1983) in the form of Klaatu, a Green Nikto who serves Jabba the Hutt. Red Nikto appear in The Phantom Menace (1999), Attack of the Clones (2002), and Revenge of the Sith (2005). Ima-Gun Di is a Red Nikto Jedi Master in Star Wars: The Clone Wars. In the 2016 novel Star Wars: Bloodline, the Red Nikto crime lord Rinnrivin Di heads a dangerous cartel based on the planet Bastatha. The bombardment of Kintan by stellar radiation from the explosion of a nearby star had sparked rapid evolution in its native species. For several centuries, the Niktos were ruled over by a violent and fanatical religious organization called the Cult of M'dweshuu, which was much despised by the majority of Kintan's population. When the Hutts were waging a war against Xim the Despot, they saw the Niktos' situation as an opportunity to recruit another servant species into their army. A fleet of Huttese starships bombarded the Cult of M'dweshuu's stronghold from orbit, wiping it out, and the grateful Niktos eagerly signed the Treaty of Vontor, placing themselves in servitude to the Hutts indefinitely. The Noghri are a primitive humanoid species with steely gray skin. They are extremely skilled assassins due to their innate abilities at stealth and hand-to-hand combat. Like the Wookiees, they respect honor above all else. The Noghri are natives of the planet Honoghr, which was ravaged by toxins from a Trade Federation core ship destroyed in battle during the Clone Wars. Darth Vader visited the planet some time later under the guise of helping it recover from the ecological disaster, in exchange recruiting most of the young males of the planet into a bond of servitude as the personal assassins of Emperor Palpatine. With the Noghri still in service to the Galactic Empire five years after the death of Palpatine, Grand Admiral Thrawn orders them to kidnap the pregnant Leia Organa Solo. Realizing that neither she nor her children would be truly safe as long as the Noghri serve the Empire, she goes to Honoghr in order to convince the Noghri to leave the Empire's service. Through their acute sense of smell, the Noghri easily recognize Leia as the daughter of the revered Vader, and she is able to use this fact to convince the Noghri that the Empire has been lying to them and has kept them in virtual slavery for many years. As a result, the Noghri turn against the Empire. Thrawn dies when his Noghri bodyguard Rukh turns on him and stabs him. Following the death of Thrawn, the Noghri ally themselves with the New Republic. They help resettle the Noghri to other planets (including Wayland) to give Honoghr time to heal. Leia and her entire family become very highly respected figures in Noghri society. The Noghri save the Solo family from a Yuuzhan Vong strike force. Much like Chewbacca did with Han Solo, the Noghri always make sure Leia has bodyguards. The Noghri appear extensively in the Thrawn trilogy of novels, written by Timothy Zahn, and are also playable in the Forces of Corruption Expansion for Star Wars Empire at War, armed with disrupter rifles. Nosaurians are reptilian creatures that have spikes on their head and beaklike mouths. One notable Nosaurian is the Podracer Clegg Holdfast. The Ogemite are a near-Human avian race native to the planet Ogem. They have yellow skin and short, blond, feather-like hair, similar to the Omwati. Although the Omwati are not a branch of humanity, the differences are extremely small. The Omwati skin is a bluish color and their eyes are generally blue or black. The size of an adult Omwati borders that of a human, although their morphology is typically slightly frailer with regard to females. There are very few Omwati with a stout physiology. Their most striking characteristic is their "hair" which appears to be made of small, diaphanous feathers of an iridescent color. Omwati do not have any other hair. The Omwati rarely left their homeworld and rarely took part in galactic events, until Wilhuff Tarkin enslaved the youngest of their species to serve as Imperial scientists. Qui Xux is perhaps the best-known member of the Omwati species. She was a researcher at the Imperial Maw Installation and a principal designer of the Death Star. The Rogue Jedi Kyp Durron ripped her memories of both this technology and her past from her mind. The Ongree are a bizarre looking species from the Skustell Cluster. The Jedi Pablo-Jill was an Ongree. The Ortolans are a race of fat blue-skinned creatures with long snouts, not all that different from a small elephant. One example is Max Rebo, head of The Max Rebo Band, contracted to play in Jabba the Hutt's Tatooine palace. Possessing a love of food and music, these small aliens are also adept at surviving the frigid temperatures of their homeworld Orto. Large manta-ray like creatures that were encountered by Lando Calrissian during his early adventures in the Outer Rim. They live in a nebula called ThonBoka where they are nourished by nutrients from their sun. They live in the vacuum of space and have the unusual ability to travel through hyperspace for short distances. If an Oswaft is deprived of nutrients from a star for too long it will turn opaque and die. They can also subsist on the waste products of spaceships such as the Millennium Falcon and produce waste in the form of valuable minerals. ^ "Grievous, General: The Expanded Universe". Star Wars: Databank. Lucasfilm. 2006. Retrieved 2006-08-11. ^ "Grievous, General: The Movies". Star Wars: Databank. Lucasfilm. 2006. Retrieved 2006-09-23. ^ "Plo Koon". Star Wars: Databank. Lucasfilm. 2006. Retrieved 2006-09-23. ^ "Gaff". Star Wars: Databank. Lucasfilm. 2006. Retrieved 2006-09-23. ^ "Mirialan". StarWars.com. 2014-06-16. Retrieved 2016-12-20. ^ "Mon Calamari". Star Wars: Databank. Lucasfilm. 2006. Retrieved 2006-09-23. ^ Lucasfilm (30 May 2002). "Silas Carson: Hero with a Thousand Faces". Lucas Online. Archived from the original on 3 January 2008. ^ Veitch, Tom, Bruce R.; Cam Kennedy; Jim Baikie (September 2006). Star Wars: Dark Empire II. Dark Horse. ISBN 1-59307-526-X. ^ "Databank: Nikto (Green)". StarWars.com. Retrieved May 23, 2016. ^ a b "Databank: Nikto (Red)". StarWars.com. Retrieved May 23, 2016. ^ "Databank: Klaatu". StarWars.com. Retrieved May 23, 2016. ^ "Databank: Ima-Gun Di". StarWars.com. Retrieved May 23, 2016. ^ Agar, Chris (May 11, 2016). "The Biggest Revelations From Star Wars: Bloodline". Screenrant.com. Retrieved May 24, 2016. ^ Granshaw, Lisa (May 10, 2016). "Behind Star Wars: Bloodline: An interview with author Claudia Gray". Blastr. Retrieved May 24, 2016. ^ "Orto", Stephen J. Sansweet, The Star Wars Encyclopedia (New York: Del Rey, 1998), p. 220. ISBN 0-345-40227-8. This page was last edited on 6 April 2019, at 17:39 (UTC).